This product is part of our optional two year warranty program. This program is enhancing one of the best service programs in the industry and offers all customers the best after-sales service possible. 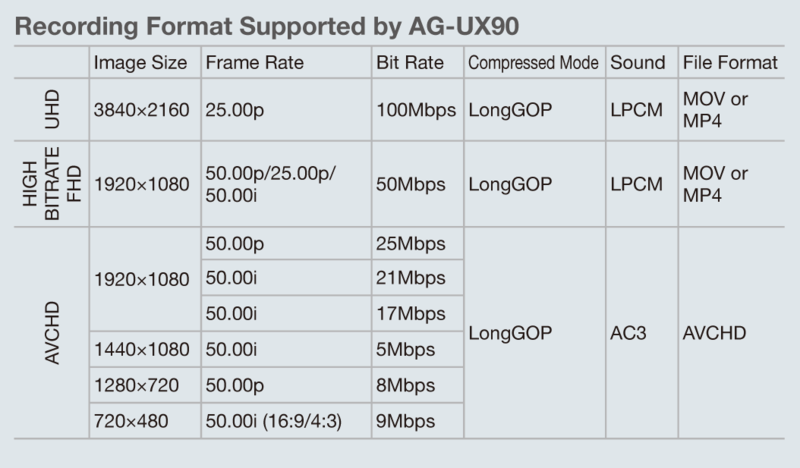 The AG-UX90 is the “UX-series standard model” for easy, high-quality 4K/FHD recording. It is equipped with a newly designed compact lens featuring a wide 24.5mm angle*1 and 15x optical zoom. Its Optical Image Stabilizer (O.I.S. 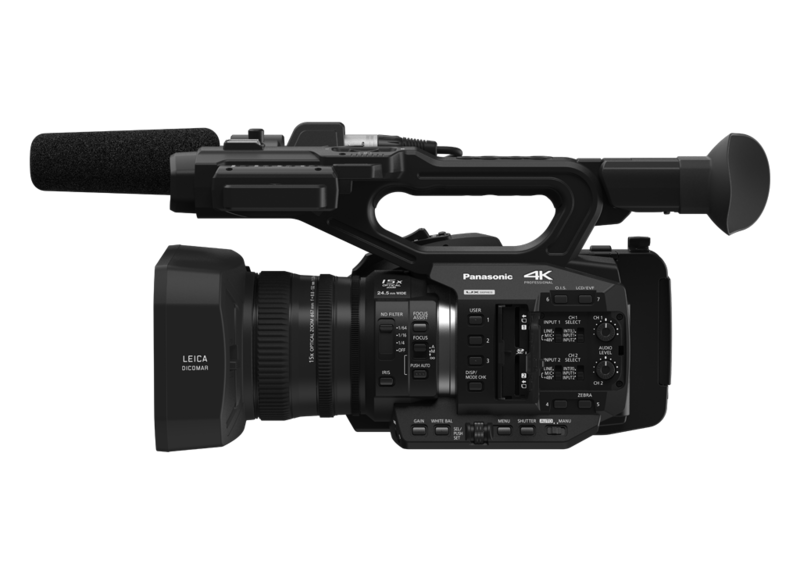 ), intelligent AF function, and Manual Three Rings are ideal for professional camera work. 15x Optical Zoom: The 4-Drive Lens System achieves both high image quality/sensitivity and compactness with a wide-angle 24.5mm*1 and 15x optical zoom lens. This speedy zoom provides quick zooming in and out. High-Resolution Intelligent Zoom: In FHD mode, the i.Zoom function increases the zooming capability to a maximum of 25x while maintaining high resolution. The i.Zoom function seamlessly switches on when the optical zoom limit isreached. LEICA DICOMAR*3 Lens: This lens has passed the stringent quality standards of Leica Camera AG. A multi-coating process minimizes ghosts and flaring, resulting in especially clear images. *1 35mm film camera equivalent in FHD mode. 35.4mm in UHD mode. *2 Using 15x Optical Zoom + i.Zoom + Digital Zoom 10x in FHD mode. The higher the magnification, the greater the image quality degradation. *3 Leica is a registered trademark of Leica Microsystems IR GmbH. DICOMAR is a registered trademark of Leica Camera AG. LEICA DICOMAR products are manufactured using Leica-certified measuring instruments and quality assurance systems based on rigorous quality standards approved by Leica Camera AG. High-Image-Quality, High-Sensitivity, 1.0-Type 4K MOS Sensor: The 1.0-type MOS sensor provides an outstanding depth of field and excellent balance between image quality and sensitivity. High-resolution recording is possible in UHD (3840x2160) 25p mode. 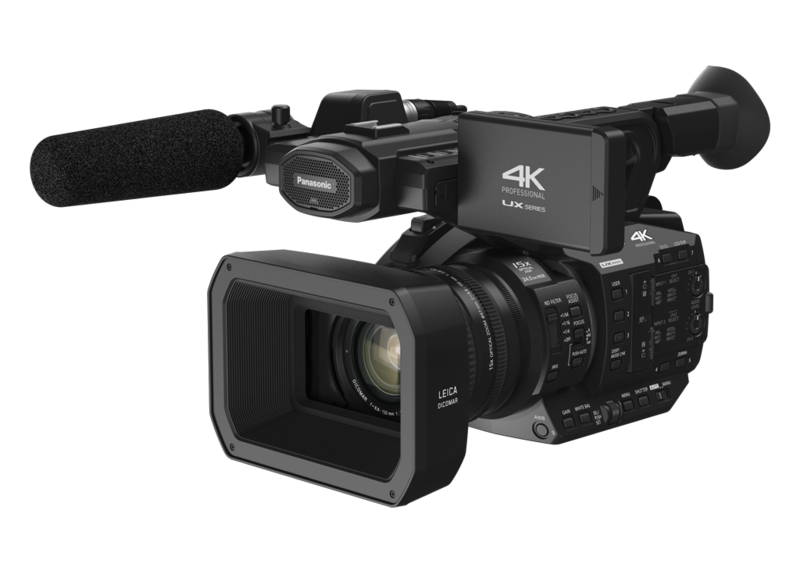 High-Image-Quality FHD Recording: Professional, high-end image recording is possible in FHD (1920x1080) mode with a 50-Mbps bit rate. UHD/FHD/SD Multi-format: Versatile recording modes can be selected according to resolution, frame rate, bit rate, and file format. 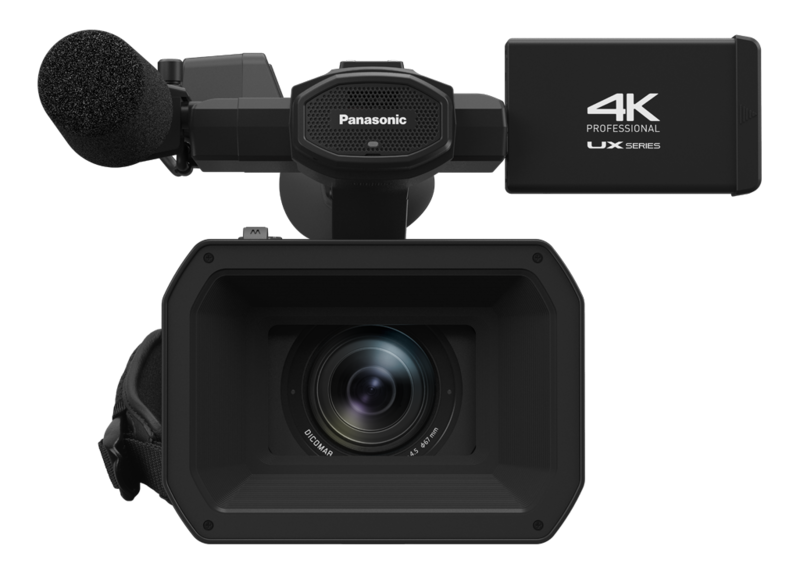 Advanced Optical Image Stabilizer [UHD/FHD]: The correction area of the Optical Image Stabilizer (O.I.S.) been expanded, which provides powerful correction even in unstable shooting situations, such as low-angle or high-angle shots. 5-Axis Hybrid Image Stabilizer [FHD]: In HD shooting modes, by using hand-shake correction that combines the effects of both optical and electronic image stabilization, hand-shake in various directions, including the rotary direction, is detected and corrected. Intelligent Auto Focus: The Microdrive Focus Unit achieves superior auto focusing with higher-speed tracking and stability even in 4K images. 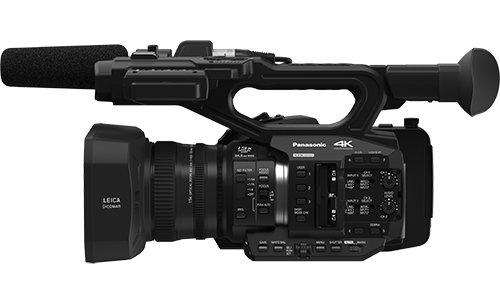 The highest class*4 of focusing speed, tracking ability, and stability are attained in 4K video cameras. 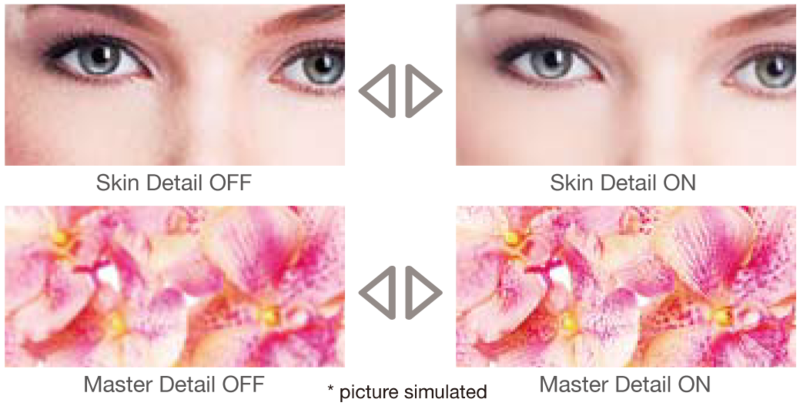 Custom AF Function: Auto focus operation can be customised by adjusting the AF Speed, AF Sensitivity and AF Area Width. This function enables the AF to operate exactly as intended by the user in accordance with the subject type or application. 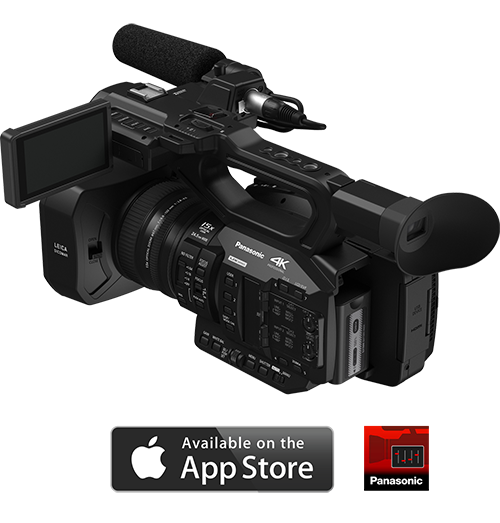 FHD VFR Recording: VFR recording can be set in 9 steps from 2 to 50 fps. Unlimited Relay Recording: By using double SD memory card slots, automatically records continuously from Slot 1 to Slot 2. By changing the SD card, images can be recorded continuously for many hours*5. Skin Detail: Makes skin colours appear soft and beautiful. Especially effective when recording the person up close. 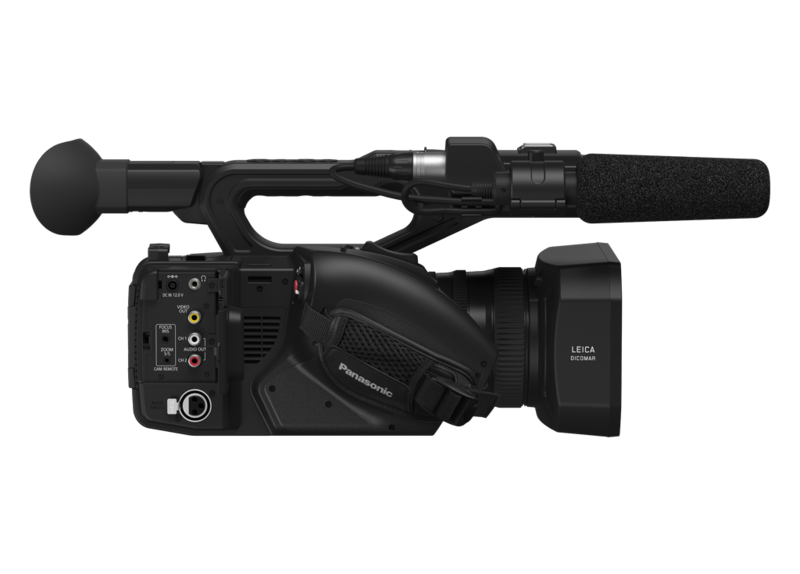 8-Mode Gamma: The AG-UX90 is equipped with eight selectable gamma modes, including two Cine-Like Gammas, drawing on technologies developed for the VariCam. Scene Files: Six files preset with picture quality settings are provided as Scene Files (Standard, Shooting under fluorescent lights, Spark, Still like, CINE-LIKE contrast, and CINE-LIKE dynamic range). You can change any of the settings as desired and store one set as a Custom File in the AG-UX90, and up to eight sets on an SD memory card. HDMI: Digital outputs up to UHD 25p and FHD 50p. XLR AUDIO IN: Equipped with two channels of XLR audio input (with switchable 48 V phantom power supply, MIC and LINE), manual audio volume and OSD level meter. iPad Remote Control: The AG ROP app for iPad*6 is available free of charge from the Apple App Store. It enables wireless remote control of the AG-UX90 with installation of a wireless module (optional AJ-WM50 or AJ-WM30). 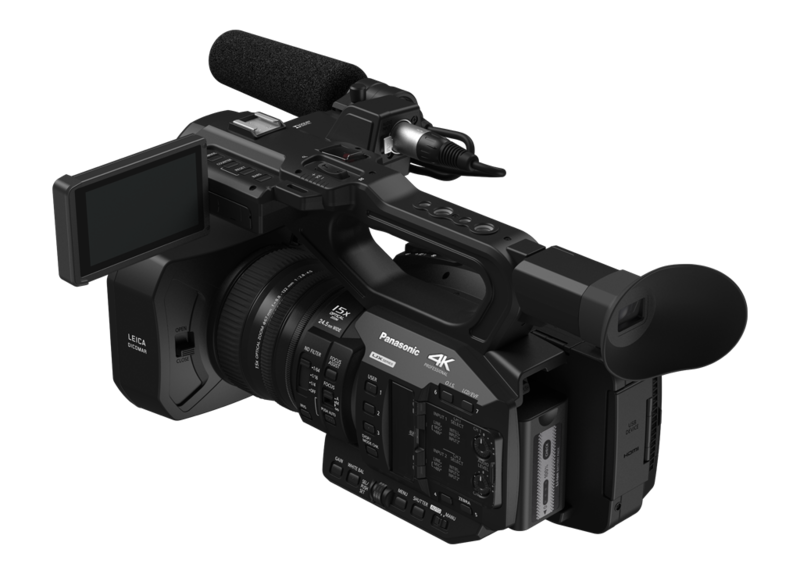 This enables a variety of control operations, including Zoom, Iris, REC Start/Stop, and picture quality settings. *5 The maximum amount of data that can be recorded over multiple SD cards is 96 GB. Recording will not stop even when the data size exceeds 96 GB. *6 iOS 7.1, iOS 8.1, and iOS 9 are supported. App Store is a service mark of Apple Inc. Apple, the Apple logo, and iPad are trademarks of Apple Inc., registered in the U.S. and other countries.